Investor confidence in Germany’s growth outlook improved for the sixth consecutive month, underpinning hope for an economic rebound later this year. A gauge measuring prospects for the next half year rose to 3.1 in April, beating an estimate for a gain to 0.5. The positive reading means optimists are outnumbering pessimists among survey participants for the first time since March last year. 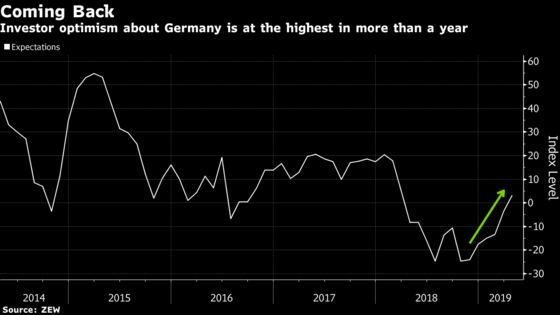 Some 28.6 percent of respondents said that the outlook for the German economy improved, compared with 25.5 percent who saw a deterioration. Investors were most pessimistic about the car industry, steel manufacturing and banking. The balance of projections for inflation in Germany and the euro area turned positive. German economic growth picked up only moderately in the first quarter and the underlying pace of expansion remains subdued amid an industrial downturn, the Bundesbank said on Monday.